ZMover lets you manage windows across several monitors with ease. The number of applications lacking multiple monitor support and the increased desktop space offered by such setups make it more difficult to maintain an optimal desktop layout. 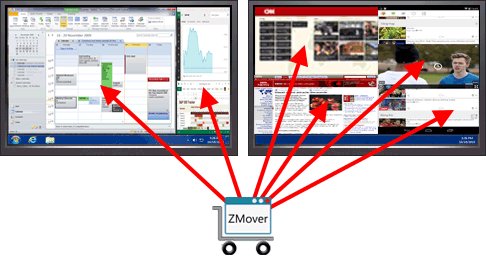 ZMover eliminates these difficulties with its ability to define window layouts for different monitor configurations. ZMover stores user preferences in a small portable file. So it’s easy to define a desktop layout on one computer and propagate it to other computers in a lab or a data processing center. Organizations and IT professionals can benefit significantly from this capability in situations where it’s important to position windows in a uniform and familiar way across many workstations. Enables you to control the position, size, and layering of any window. Includes a toolbox to easily manage windows on multiple displays. Backs up and restores desktop icon positions. Adapts to display configuration changes on the fly. Added the /Enable and /Disable command line parameters and fixed /ResetAll. Fixed the "Ignore resizing on full screen" handler property. Resolved a Microsoft Office 2013 issue occurring when	Outlook and Word handlers are simultaneously active. Eliminated confirmation messages after backing up and restoring desktop icons. Fixed the handling of Microsoft Office applications. Added a desktop icons backup item to the taskbar notification area icon menu. Performed a Windows 8 compatibility update. Added the ability to filter windows by class name only. Added a Reset All Handlers hot key. Modified the behavior of the Handler description Default button in the Window Handler window. Initialized the monitor number to the current window position in the Window Handler window. Fixed: captured window position may be incorrect when the taskbar is docked on the left. Fixed: handlers sorting order is not restored from previous session. 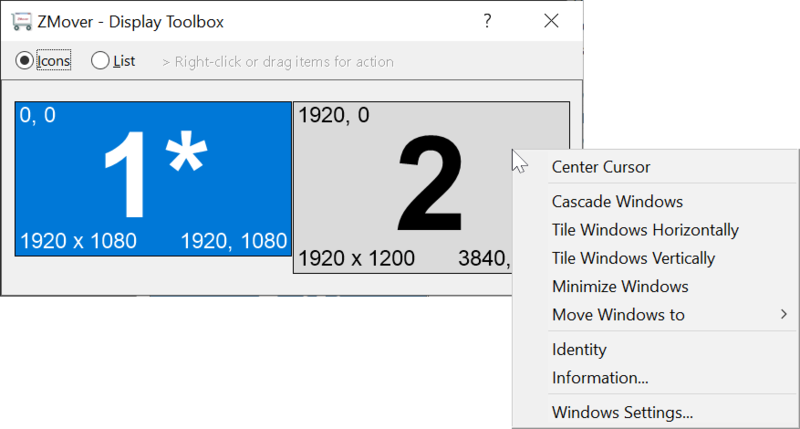 Added to the Toolbox context menu a command to move all windows to the right-clicked monitor. Added to the taskbar notification area icon menu a shortcut to restore desktop icons. Added the ability to automatically create handlers for all opened applications. Added the ability to automatically arrange desktop icons whenever the display configuration changes. 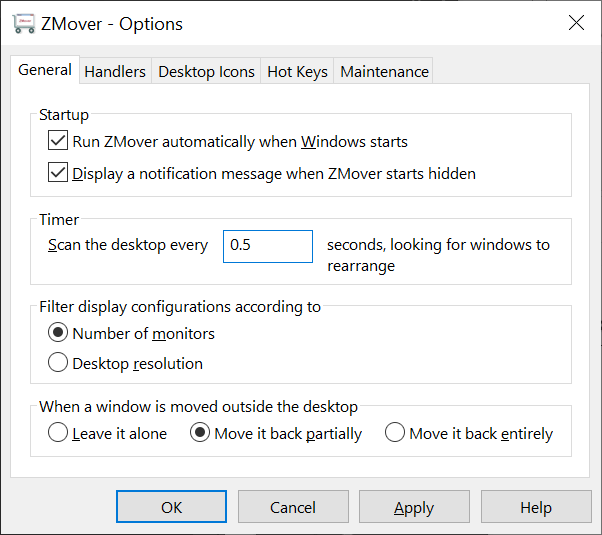 Prevented Zmover windows from opening outside the desktop, which could occur in earlier versions after reducing the display resolution. Added work/total monitor area to the Display Information window. Fixed: in some cases, disabling Zmover wouldn't stop desktop scanning. Fixed: in some cases, the display resolution was incorrectly reported in the Handlers Options section. 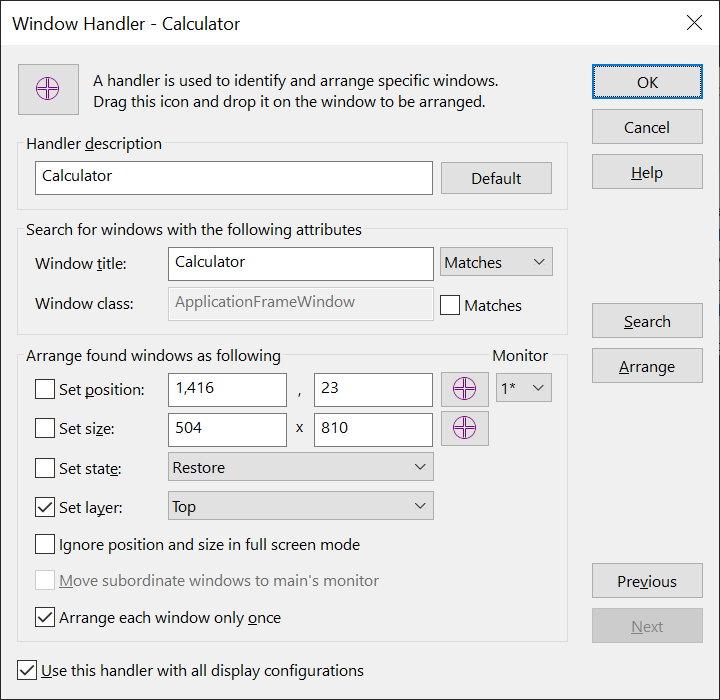 Added the ability to selectively associate window handlers with different monitor configurations. This enables you to choose with which monitor configuration a handler will be active. Added the ability to define a different handler targeting the same windows for each monitor configuration. This enables you to rearrange the same window differently depending on the monitor configuration. Added the ability to back up and restore the program data file containing user settings and handlers. View your configuration graphically and textually. Arrange windows on any monitor. Move windows from any monitor to another. Save and restore desktop icons. Invoke commands using hot keys. Move the cursor between monitors using a hot key. Display monitor identity on any monitor. Added window class name filtering to window identification. Added options to handle windows moved outside the desktop. Tweaked the program to enable a window initially minimized/maximized, to be minimized/maximized on a different monitor. Added a multiple monitor desktop option to move subwindows to their parent's monitor. Added a Hits column context menu item to reset all hit counters. Added clicking options to disable, enable or toggle all handlers. Added the ability to resize the main window. Displayed a taskbar notification message when Zmover starts hidden. Made the [X] button in the window title bar hide Zmover instead of closing it. 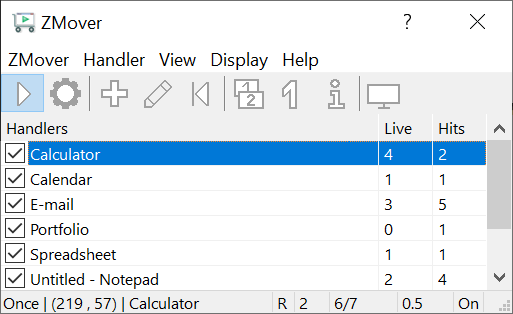 A column displaying the number of windows currently displayed on the desktop. A column displaying the number of windows that have been rearranged. Added shortcut keys to the taskbar notification area icon to enable/disable Zmover and reset window handlers. Added a switch to run Zmover when Windows starts. Extended the window centering feature to cover auxiliary monitors. For Windows 2000, XP, Server 2003, or later: Added support for multiple Windows user accounts. Minimized the amount of memory used when the main window is hidden. For all Windows versions: Showed the main window when trying to run a second instance of the application. Discontinued Windows 95 and NT compatibility. Added support for Windows XP visual styles, multiple monitors, and regional settings. Added desktop scanning frequency adjustment. Added support to center windows on the desktop. Overhauled the user interface, added the ability to modify any window setting on the fly, covered new window settings, and added a scanning switch. Added a menu item to reset all desktop windows. Added support to handle windows without a title. Added support to move and size other windows, and added an equality filter to window title matching. Updated installation procedure and package information, and added the ability to remember targeted windows. Increased the flexibility of windows targeting.